Tenth anniversary of the Iraq war is a reminder how consequential of a political event it was… RNC releases its “autopsy” on the 2012 election… But what if the policies -- and not the messaging -- are contributing to the GOP’s brand problems?... Cook: GOP redistricting might have been short-term winner, but long-term loser… Obama to pick Tom Perez for Labor secretary… Recapping CPAC… And Mark Sanford’s first (and easier) test. *** A consequential anniversary: It's another busy week in American politics. At an event this morning beginning at 8:00 am ET, the Republican National Committee is releasing its “autopsy” on the 2012 elections and its recommendations going forward. Tomorrow, President Obama departs for his four-day trip to Israel and the Middle East, and South Carolina holds its primaries (featuring Mark Sanford and Elizabeth Colbert Busch) to fill the state’s vacant congressional seat. But in our eyes, the biggest story this week is Tuesday’s 10th anniversary of the beginning of the Iraq war. Why? Because when you look back on it, the Iraq war is the most consequential political event of the past 10 years -- and probably beyond. The war (and especially its growing unpopularity) is one of the chief reasons why Barack Obama is in the White House; it explains how Democrats took control of Congress in 2006 and how they expanded their gains two years later; and it was the issue that damaged George W. Bush’s second term and post-presidential legacy (at least so far). And the damage the war did to the Republican brand is something from which the GOP still hasn’t fully recovered. Indeed, a Jan. 2013 NBC/WSJ poll found that 59% of Americans don’t believe the Iraq war was worth it -- a percentage that has continued to grow since 2003. And a new Gallup poll finds 53% of Americans saying it was a mistake. 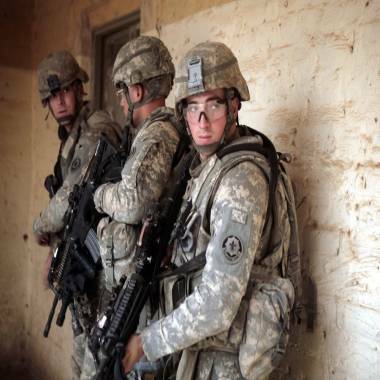 In this July 9, 2008 file photo, U.S. Army soldiers from Charlie Battery, Fires Squadron, Second Stryker Cavalry Regiment prepare to search a classroom as they occupy a school during Operation Fires Festung in Qubah, north of Baghdad in Iraq's volatile Diyala province. *** And a big political story: Of course, Iraq is much more than a political story. It’s a story about lives lost and money spent, about the change in the balance of power in the Middle East (there is no doubt that Iran is stronger post-Saddam Hussein than it was before), about whether the Bush administration was honest with the American people why the country went to war, and about how the U.S. is now much more hesitant to intervene abroad (see Libya and Syria). But its effect on American politics can’t be understated, even 10 years later. Without Iraq, there would be no President Obama. He rode Iraq to the nomination, making it the most important distinction he had with Hillary Clinton. Shoot, John Kerry isn’t the nominee in 2004 were it not for Iraq and the Democrats’ urgency at the time to find someone with war credentials as their standard-bearer. Iraq changed a lot in American politics. And that’s why the anniversary is important. While speaking Monday at a National Press Club breakfast, RNC Chairman Reince Priebus reflects on what may have gone wrong for the GOP during the 2012 presidential campaign. *** RNC releases its “autopsy” on the 2012 election: The discussion of Iraq is instructive as the RNC releases its recommendations after the party’s electoral losses in 2012. The reason: The policies a party pursues still matter -- a lot. The RNC’s “Growth and Opportunity Project” proposes plenty of intriguing reforms such as spending $10 million hiring paid staff to do better outreach to minority communities; cutting down on the number of presidential debates; recommending to hold its convention before August (so the nominee can tap into general-election funds earlier); and hiring a chief digital and technology officer to close the GOP’s technology gap. What’s more, the report recommends that GOP candidates do a better job of communicating. "To be clear, our principles are sound," RNC Chair Reince Priebus is expected to say in his remarks. "But the report notes the way we communicate our principles isn't resonating widely enough. Focus groups described our party as 'narrow minded,' 'out of touch,' and 'stuffy old men.' The perception that we're the party of the rich continues to grow." *** But what if it’s the policies -- and not the messaging? Yet here’s the question to chew on: What if the policies are also contributing to the GOP’s brand problems? The party wants to spend millions on minority outreach. But you could also argue that the GOP’s past opposition to Obamacare and immigration reform, as well as its pursuit of voting laws that impact minority communities, has been just as significant to its performance with these voters. The party wants to limit the number of debates. But was the number the problem in 2012, or was it more the substance and policies being discussed (for example, all the candidates rejecting a 10-to-1 deal on cuts to revenues)? And the party wants to change the perception that it’s the party of the rich. But just this week, the GOP-controlled House is expected to vote on the Ryan budget plan, which gives the wealthy a significant tax cut while cutting programs that benefit the poor. After all, don’t forget these exit-poll results from the 2012 presidential election: A combined 60% of voters said tax rates should go up either for all Americans or for those making more than $250,000, and 59% said that abortion should be legal in all or most cases. And we have one final question: How much of this is fighting the last war? Sure, limiting the number of debates and holding a convention in July seems smart after what happened in 2012. But don’t forget, John Kerry and the Democrats in ’04 still lost after holding few debates and a July convention. The Washington Post's Eugene Robinson and Bloomberg View's Margaret Carlson join Morning Joe to talk about President Barack Obama's charm offensive on the Hill, the budget battle and CPAC. MSNBC's Joe Scarborough comments on the budget battle and says, "we have to stop this generational theft." The panel also talks about Reince Priebus' plan to help makeover the GOP including a promise of $10 million in community outreach. *** GOP’s redistricting was a short-term winner, but what about the long term? As the RNC says it will spend $10 million to do better outreach with minority and younger-vote communities, Charlie Cook made a striking observation over the weekend: Republicans, through redistricting, protected their members in 2012 but boxed themselves into mostly white congressional districts. “[Republicans] clearly did everything they could to purge Democratic voters from their districts ahead of 2012, no matter whether those voters were white, black, Hispanic, left-handed, or right-minded—just as Democrats would have done had the roles been reversed. But in the process of quarantining Democrats, Republicans effectively purged millions of minority voters from their own districts, and that should raise a warning flag. By drawing themselves into safe, lily-white strongholds, have Republicans inadvertently boxed themselves into an alternate universe that bears little resemblance to the rest of the country?” Just where is the RNC going to be able to test run this new outreach? A handful of gubernatorial races perhaps? Maybe a Senate race or two? Having the ability to test run in House districts would get them farther, faster, but that isn’t going to happen.